Another select vintage from the late Ernest Martin. I can't say I agree with every jot and tittle he ever wrote but I find that he was on the right track in this area and I've only found stronger biblical support over many years. The word “sign” in the above verse is translated “mark” in its second occurrence in the Bible and it refers to the “mark” given to Cain (Genesis 4:15). The biblical definition of the “mark” (or “sign”) in the hand and forehead is associated with holy days on the Mosaic calendar. The next usage refers to the commandments, statutes and judgments that the Israelites were to perform when they entered the land of Canaan. 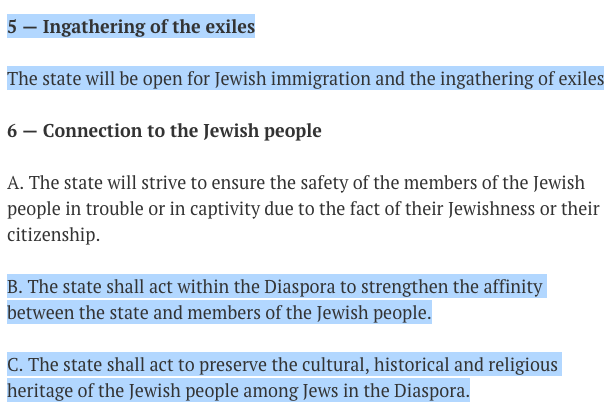 The third reference is similar to this and is given in Deuteronomy 11:18. The weekly Sabbath is described as such a “sign” (or MARK) in Exodus 31:12–17. If we let the Bible interpret the Bible then the MARK (or sign) in the hand and in the forehead of Revelation 13:16–17 refers to the keeping of the Mosaic legislation — its holy day system and regulations for the people of Israel in the land of Canaan. And this is what the Antichrist will subject the world to when he commences his reign in Jerusalem just before the true Second Advent. He will display to the world his supposed divinity, the world will accept it, he will sit himself with great ceremony in the temple at Jerusalem, and then proclaim himself the true divinity come from heaven to reside among men (2 Thessalonians 2:4). AUX, do you have anything to share regarding The Peshitta? This is the reason and purpose for this forum, as you might know. (07-15-2018, 05:00 PM)Thirdwoe Wrote: AUX, do you have anything to share regarding The Peshitta? This is the reason and purpose for this forum, as you might know. But while I'm here -- in Semitic thought "mark" and "name" are quite synonymous. "and the smoke of their torment will rise forever and ever. And they will not have relief, day or night, those who were worshipping the creature and his image and who took the mark of his name"
Following the (renewed) Sinai covenant, the Name or mark would be set upon the congregation during the Aaronic Benediction, where the hands form two shins (שׁ) for the name Shaddai (also depicted on the tefillin on the forehead and arm) -- the Holy Spirit ("Shekhinah glory") given to the congregation as the bride of YHWH. "And they shall bestow the benediction of My Name upon the sons of Israel, and I, by My Word, will bless them." (Pseudo-Jonathan)"
God's Glory was also between the wings of the two Kerubim golden images of the ark. 22 Then Aaron lifted up his hands toward the people and blessed them, and he stepped down after making the sin offering and the burnt offering and the peace offerings. 23 Moses and Aaron went into the tent of meeting. When they came out and blessed the people, the glory of the LORD appeared to all the people. 36 At the time of the offering of the evening sacrifice, Elijah the prophet came near and said, "O LORD, the God of Abraham, Isaac and Israel, today let it be known that You are God in Israel and that I am Your servant and I have done all these things at Your word. 37 "Answer me, O LORD, answer me, that this people may know that You, O LORD, are God, and that You have turned their heart back again." This along with conducting a census of the (regathered) tribes of Israel as did Aaron with Moses (Num 1.3) further supports the false prophet Elijah (the second beast) functioning as the High Priest (John the Baptist who came in the spirit of Elijah was also of priestly lineage) -- and like Aaron he will lead the congregation to make an image (cf Rev 13.14-15). 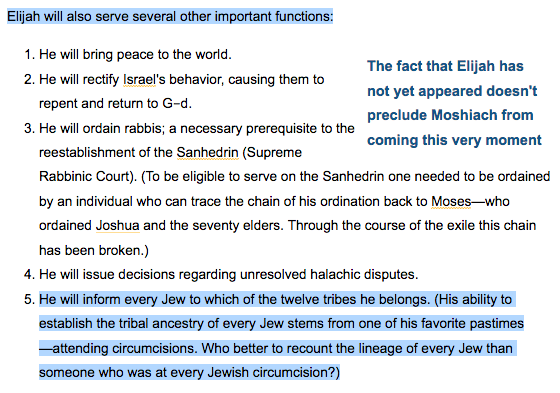 Interestingly, according to Orthodox Jewish (Hasidic) teaching when Elijah returns he will be in charge of sorting out who belongs to which of the 12 tribes and will establish tribal ancestry (presumably with no little assistance from those genetic ancestry services curiously hyped for years on TV shows with celebrities and companies like IBM working with National Geographic on the Genographic Project - nevermind IBM's history working with Nazi Germany to develop the numbering system used in the concentration camps as Edwin Black documents). This agrees with the indication of him involved in a census in Rev 13.17-18. 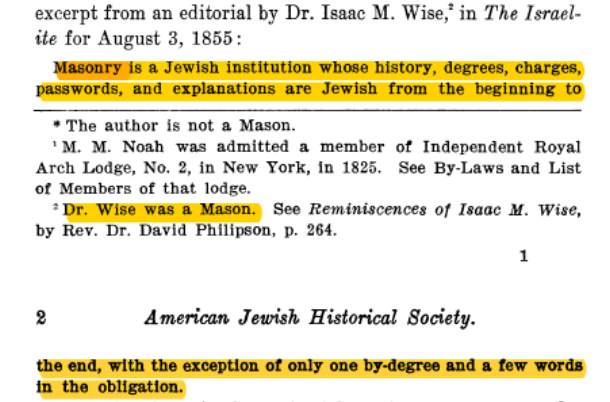 The father of American Reform Judaism, Rabbi Isaac Wise, confirmed what some may have already concluded, Freemasonry is a Jewish Institution (I would specify it more as a so-called 'Zionist' front for recruiting hoodwinked and compartmentalized Gentiles to the cause of the 'great work' of establishing Solomon's temple and the Jewish antichrist kingdom to rule all nations); and Freemasonry founded America which has been and continues to be the leader in empowering the modern state of Israel until the transfer of full power is complete followed by its removal as the world superpower well underway now. 9 Behold, I will cause those of the synagogue of Satan, who say that they are Jews and are not, but lie-- I will make them come and bow down at your feet, and make them know that I have loved you. Your ideas might get more attention on Facebook in some of the conspiratorial new world order groups. (07-16-2018, 02:33 AM)Thirdwoe Wrote: Your ideas might get more attention on Facebook in some of the conspiratorial new world order groups. In case you missed this too, an international hidden agenda (conspiracy if you wish) is explicitly in the word of God both from the OT and NT and indicates Jerusalem as the leader of it - that is until the table is turned against it and decimated, save the 144,000 remnant. So it's not my idea, I'm just calling attention to it. It's funny how weak-minded people shy from this subject because the media dog-trains people to be dismissive of it when it's actually quite a deadly serious subject in the bible intimately tied to events at the end of the age, but sad how misguided Christians and others turn a blind eye (or lend support) to the crimes and blasphemy of what is called a rebellious, defiled and tyrannical city in Zephaniah chapter 3 where we see the priesthood back in operation, rather than reaching out with the Gospel and warn them of the coming holocaust they will suffer from their 'allies.' And since this is a place for general discussion on the bible I don't need to go to FB, but knock yourself out. 4 They have said, "Come, and let us wipe them out as a nation, That the name of Israel be remembered no more." 3 "Let us tear their fetters apart And cast away their cords from us!" 2 with whom the kings of the earth committed acts of immorality, and those who dwell on the earth were made drunk with the wine of her immorality." (NAU) 18.3 also says: "and the merchants of the earth have become rich by the wealth of her sensuality"
Who is the Harlot woman? 16 And the ten horns which you saw, and the beast, these will hate the harlot and will make her desolate and naked, and will eat her flesh and will burn her up with fire. This scenario is a repetition of a previous situation from the OT when apostate Israel was playing the harlot with various nations after the time of Solomon who set up a trade-bloc in the middle east which went downhill in Ezekiel 16.35-39; Egypt, Philistia, Assyria, Chaldea are named in vv 26-29. The new law also sets the table for this to happen at some point ahead of us.